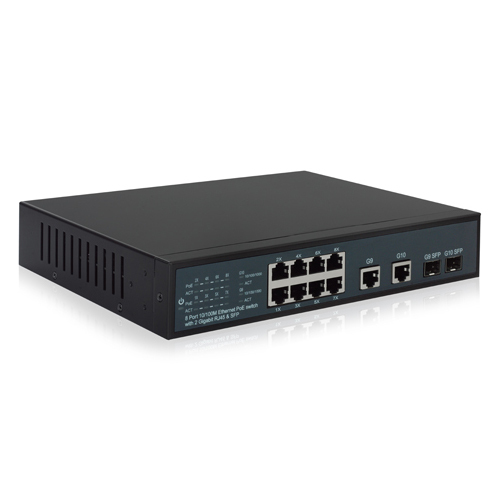 The MT-PSE1210-8P combines a high efficiency 8-port 10/100Mbps Ethernet switch with 2x10/100/1000Mbps-T port and 2x Gigabit combo SFP slot with 8-port IEEE802.3at standard Power over Ethernet (PoE). All 8 PoE ports can provide 25W power as well as 10/100M data transmission through the Cat5/5e/6 cables. MT-PSE1210-8P is a Power Source Equipment (PSE) and fully compatible with Powered Devices (PD) that comply with the IEEE 802.3at PoE standard, allowing users to attach any IEEE802.3at compliant device such as wireless Access Points (APS), VOIP phone, IP camera, printer and Network Attached Storage (NAS) without additional power. The unit is designed for home and small business users and it is a cost effective solution for environments where AC power is not available or too costly to install. The Plug-and-Play design make easy installation and operation, and all ports support Auto-MDI/MDIX, you don’t have to worry about the cable type any more. Copyright © Shenzhen Marstars Technology Co., Ltd. All Rights Reserved.